The progress of an organization rises and falls with the quality of its leadership. Personalized Coaching: Leadership is not for the faint of heart. It’s filled with tough decisions, unexpected situations, and complicated relationships. We coach leaders to apply the BEHAVIORS that make for exceptional leadership. We empower leaders to raise up capable new leadership. Contact us for an assessment of your needs and a detailed over view of our services. Team Development: High functioning teams successfully leverage teamwork from the leaders involved, in everything from creativity to completion. This requires thoughtful team leadership that selects and engages members not just for specialized expertise, but also for collective contribution. Contact us for an assessment of your needs and a detailed overview of our services. 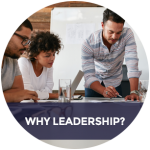 Mastery Forums: We bring leaders together from different organizations and industries, developing leadership skills in a small group setting. Facilitated by expert leaders, these Mastery Forums build skills for the participants, and provide a “safe place” to get wise advice for tough leadership choices. Contact us for an assessment of your needs and a detailed overview of our services. Leadership Certification: The best leaders perform well themselves, develop OTHER leaders, and expand total capacity for leadership. Our clients learn how to establish a leadership development “pipeline”, and then we certify them as Coaching Leadership™ organizations. Contact us for an assessment of your needs and a detailed overview of our services.